Probably fifteen or more years ago I got “revved up” on woodworking, went out and bought a bunch of power tools while at a woodworking show. I’d done wood shop in junior high, and felt invincible. I also had a credit card with no balance and had visions of building a house full of furniture. I made a couple of pieces, but my vision and focus were out of alignment with my skills. 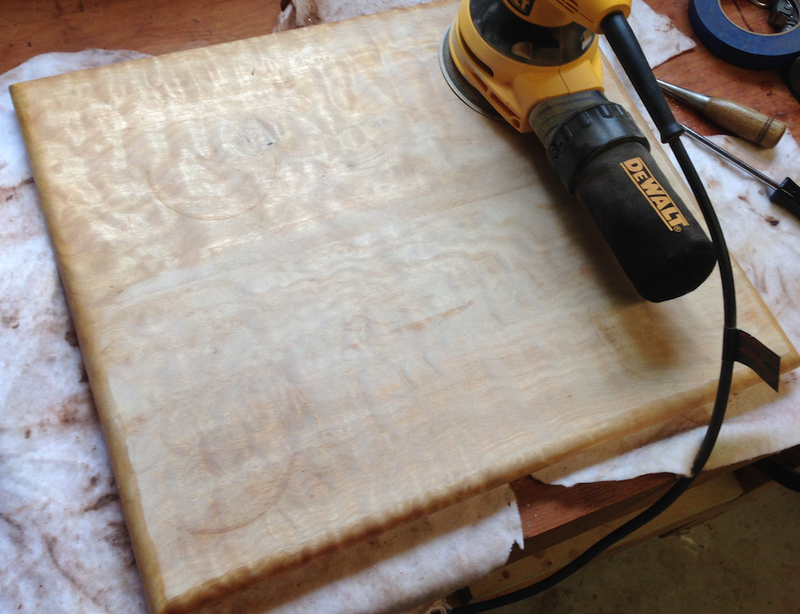 I didn’t have any hand tool chops, and after six or eight projects I got distracted with a customized Studebaker pickup project and later starting and growing a chopper parts business. 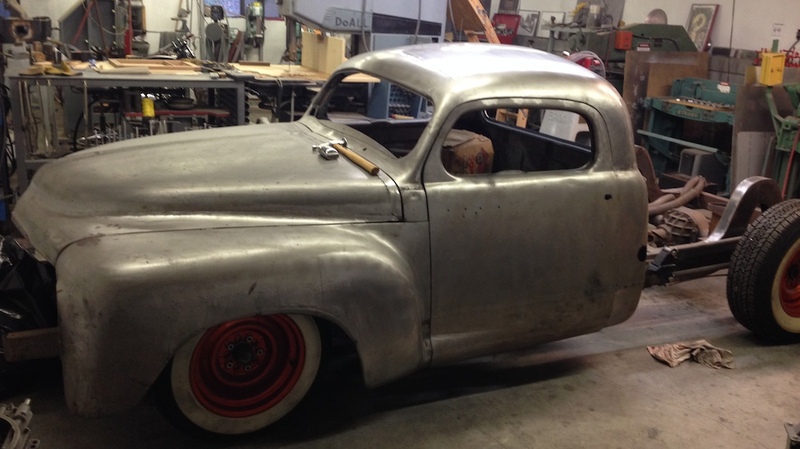 Custom Studebaker – Chopped 4″, Sectioned 6″, Caddy 500 motor, independent front suspension… One of these days I’ll get back to work on this project. 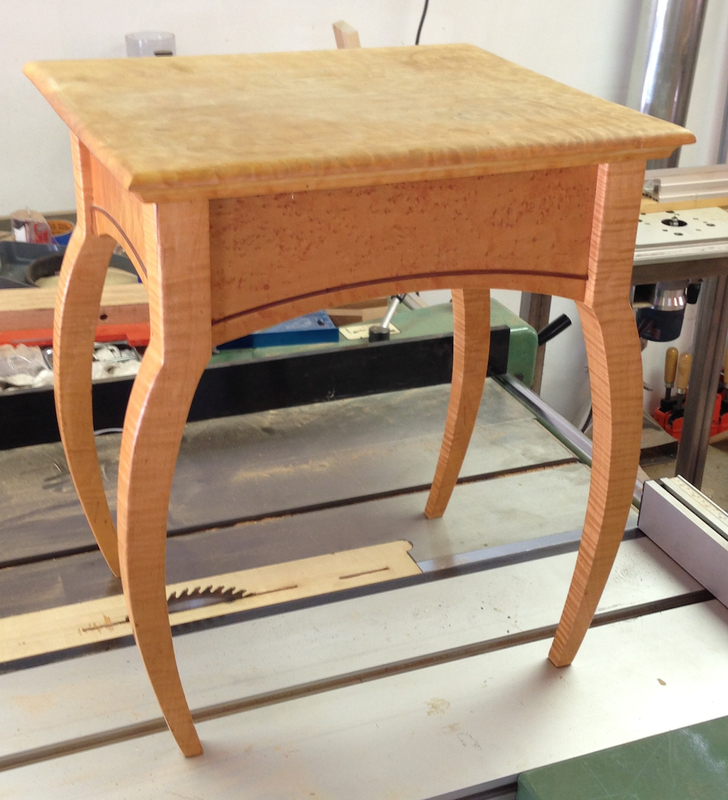 One of the projects I completed was this table, affectionately known as the “Spider Table”. I drew this out old-school using a t-square, french curves and a compass. I was keen to play with figured woods, and decided to use a combination of Birdseye, Tiger and Western Quilted Maple. I added the Bloodwood banding by laminating it between two other pieces of Birdseye Maple, and decided to have a looser arc for the banding than for the bottom of the skirt. This table has served yeoman duty in our living room ever since. We get an unholy amount of sun and heat in that room with large windows, two sliding glass doors and a southern exposure. Even though I waxed the top periodically it was scratched, faded and even worse cupped. The metal z-clips had worked loose so the top was loose on the base. Long story short, it had seen better days. So I dragged it out to the shop and pulled the top the rest of the way off. 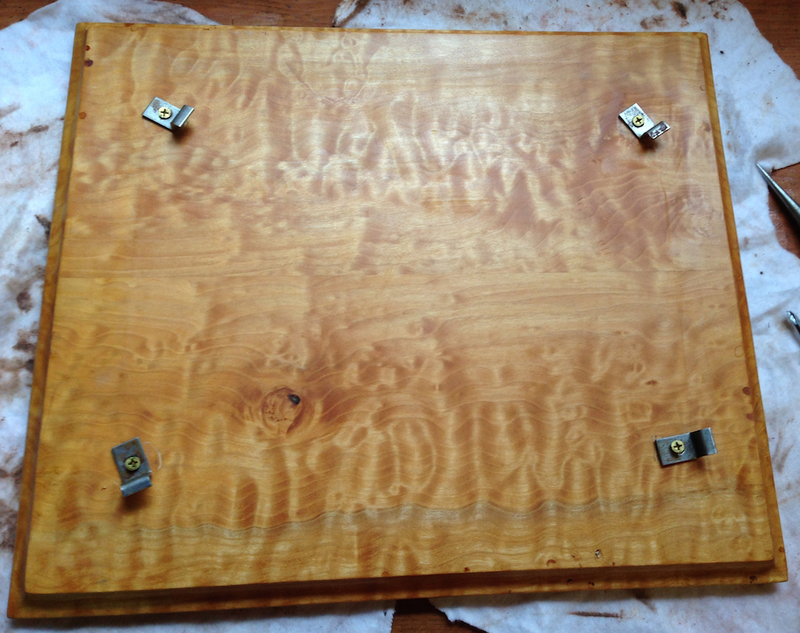 The original finish was plain Watco Danish Oil, and held up just fine on the bottom. Even the legs seem OK. 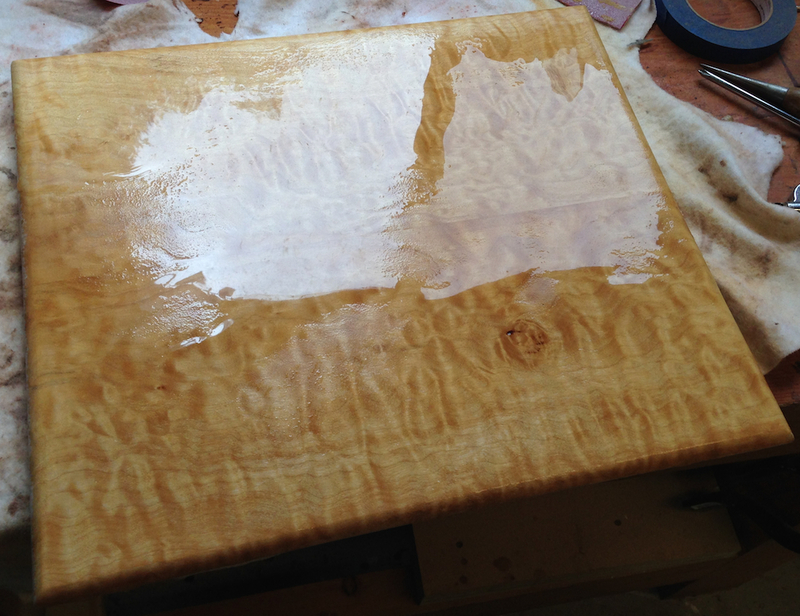 Starting to sand the top to remove the coffee stains and gouges. After sanding it I sprayed both sides with water, I tried to soak the top in particular. 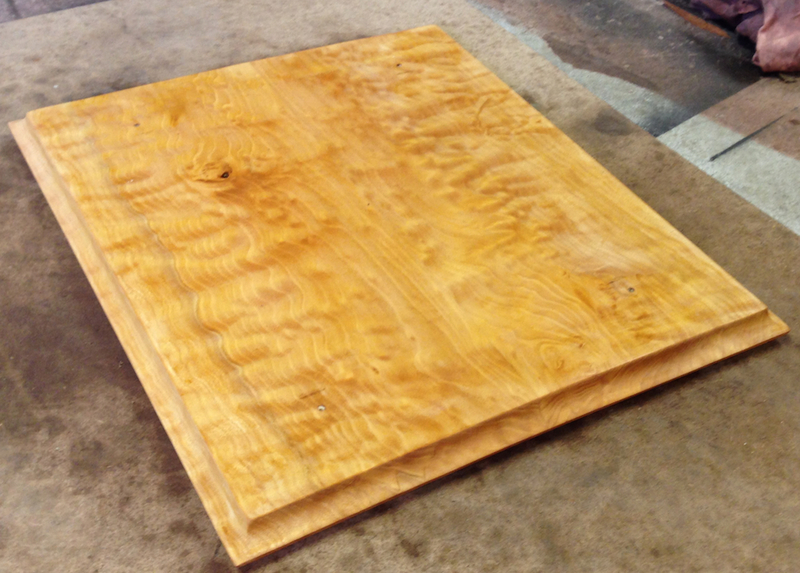 I noticed that if I lay a board on the garage floor it will invariably cup away from the floor. If I flip it over it will reverse itself. I used this trick to straighten out a severe cup in the lower shelf on the Thorsen Table, so I figured I’d try it again. Top saturated with water to try to reverse the cupping. Tabletop, cupped side down on the floor. I moved it off the MDF and directly onto the concrete after this picture was taken (and after I cleaned up the mess in the shop). …ok, I just checked it after 24 hours. It seems to have moved a tiny bit, but it’s no where near flat yet. So, another spritz of water, and back on the garage floor for another day. If it took 15 years to warp this might not work as well as I’m hoping. I’ll give a couple of days and see where it ends up. If I can’t get it to flatten out, I’ll have to live with it as-is. 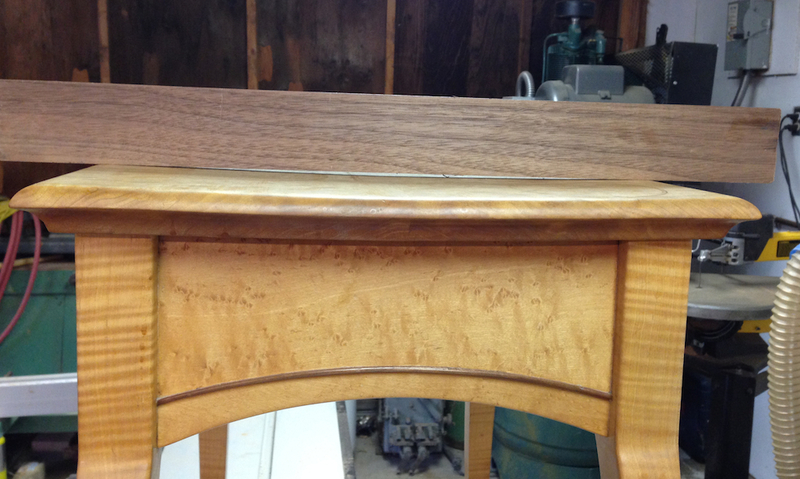 My thinking is that I’ll sand the whole thing — only lightly on the base, then hit it with Linseed Oil and a Shellac top coat. If it was bare wood I might consider using a very light dye to bring out the figure, but I’m trying to keep it simple and just put this table back in service. I like the table you just did but my tastes run more with the spider table. Is it going back to the living room? I’m not sure Ralph. Probably, at least in the short term. This weekend I’ll start applying finish to the “Thorsen Cabinet”, and finish the framework for the stained glass panels that will go in it. The materials for the stained glass panel won’t be here for a week, so I’m at least two weeks from finishing that.